Looking for the perfect gift? Look no further. 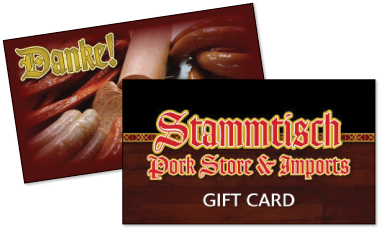 We have gift certificates and gift cards available for both the Stammtisch Pork Store and Zum Stammtisch Restaurant. Available in any denomination of your choice, it's a wonderful way to say "danke! ", whether you want that special recipient to enjoy an authentic German dining experience in our restaurant or in the comfort of their home.